Humidity, which is moisture in the air, can sometimes be unavoidable. It isn’t only a problem for hair, it can be hazardous to your home, health, and finances. To reduce humidity you need to know where it lives and how to deal with it. Humidity breeds mildew, mold, and dust mites, which exasperate breathing conditions like asthma. Worst of all is that you cannot really see mold or dust mites until they become a serious problem. Humidity can also cause areas in the home to rot, a situation that can become a magnet for pests. The expenses that arise from high humidity include health bills, possible mold removal services or home repair, bug/pest control, and higher energy costs from trying to level the humidity with prolonged use of fans and air conditioning. Because heaters work overtime during the winter – bringing in a a mixture of winter weather with the heat – winter months can be the most prosperous for humidity. Regardless of the season, humidity can be at home in the kitchen and bathroom, both areas that are heavily frequented throughout the day. One clear sign of high humidity is moisture buildup. If you see wet areas/spots on ceilings or walls, you may have a humidity problem. If moisture buildup has been around for a while, there may also be mold. To reduce humidity in the home, properly ventilate. Turning on air conditioning and fans can help, but they add to energy costs. One solution is using a bath fan timer. 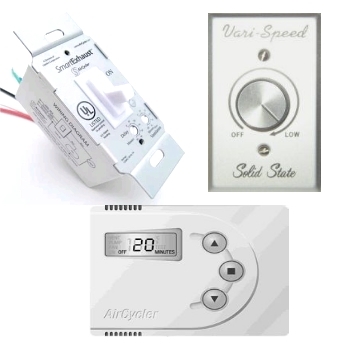 Ventilation timers work with the HVAC system or exhaust fans in your house to release air at set times. This balances the ventilation in the home and discourages moisture buildup. An added bonus: there’s no need to keep the air conditioning on all day long, which reduces how much energy is used in the home and therefore lowers your energy bill. Save your health, home, and pockets by following these simple tips to properly ventilate your home.